The navX-Micro circuit board contains sensitive circuitry, and should be handled carefully. An enclosure is recommended to protect the navX-Micro circuit board from excessive handling, “swarf”, electro-static discharge (ESD) and other elements that could potentially damage the navX-Micro circuitry. An enclosure for the navX-Micro is available, and designed to support the 16mm mounting grid on a Matrix or Tetrix robotics system as used in FTC robotics. An alternate enclosure version designed by a FRC mentor is also available. Those who prefer to print the enclosure using their personal 3D printer, enclosure design files (in STL format) is available in the “enclosure” directory of the latest build. Those who prefer to purchase the enclosure can order it from Shapeways (which usually takes about two weeks); the price will be approximately $20 plus shipping, depending upon the type of material used. If you’re in a hurry, the enclosure is also available at the Kauai Labs store. navx-micro-lid.skp: Sketchup 3D Design File for a lid-style enclosure for the navX-Micro circuit board. 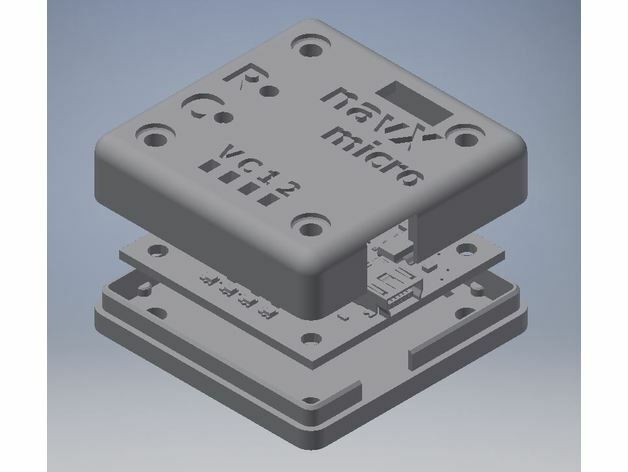 navx-micro-lid.stl: STL Format File for 3d printing the lid-style enclosure for the navX-Micro circuit board. navx-micro-base.skp: Sketchup 3D Design File for a base of the enclosure for the navX-Micro circuit board. navx-micro-base.stl: STL Format File for 3d printing the base of the enclosure for the navX-Micro circuit board. The Sketchup (.skp) files can be edited using Sketchup Make. Then, the files can be exported to a STL format using the Sketchup STL Import/Export extension. Finally, these exported STL format files can be opened and 3d-printed using applications including netfabb. The Lid Enclosure can be secured to the robot by four screws. This will secure not only the Lid, but will also secure the navX-Micro circuit board. Corey Applegate, mentor on FRC team 3244 [“The Granite City Gearheads”], has created an alternate enclosure for using navX-Micro with a FIRST FRC control system, which is publicly available on Thingiverse.